What do you think is my treasure? Can you guess? Today let me talk about my treasure. My treasure is the oil paintong that I drew when I was 10 years old. I drew it in the art club that I went. I have loved drawing pictures since I was very small. But I drew an oil painting for the first time. So this was my big step. An oil painting is drawn on a big canvas. I was moved when I finished drawing the picture. When I see this picture, I think I will draw a picture better than this one. And I'm encouraged by this picture. So I display this picture in my room. My father has drawn oil paintings when he was a child. His picture is unique. But it is charming. I was a member of the art club in junior high school. 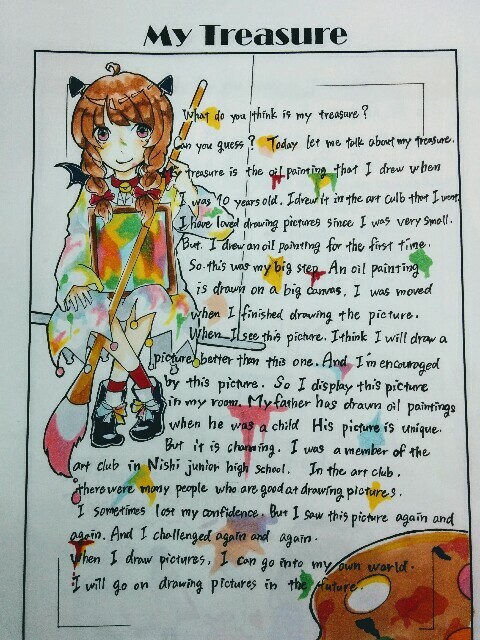 In the art club, there were many people who are good at drawing pictures. I sometimes lost my confidence. But I saw this picture again and again. And I challenged again and again. When I draw pictures, I can go into my own world. I will go on drawing pictures in the future.